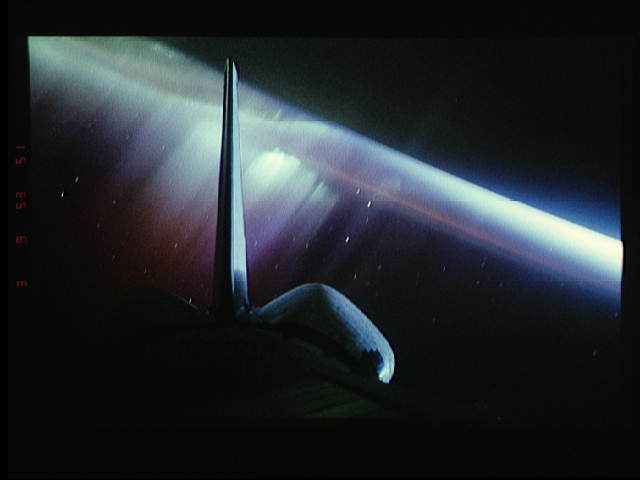 Explanation: Sailing upside down, 115 nautical miles above Earth, the crew of the Space Shuttle Endeavour made this spectacular time exposure of the southern aurora (aurora australis) in October of 1994. The aurora, also known as the northern and southern lights, appear as luminous bands or streamers of light which can extend to altitudes of 200 miles. They are typically visible from the Earth's surface at high latitudes and are caused by high energy particles from the Sun. 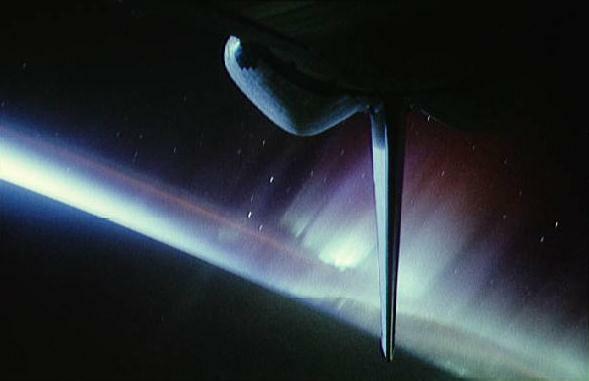 The delicate colors are caused by energetic electrons colliding with oxygen and nitrogen in the atmosphere. In this picture, the rear structure of the Space Shuttle is visible in the foreground with the vertical tail fin pointed toward Earth. Star trails are visible as small streaks above Earth's horizon.